Home | Blog | Do You Torture Your Teeth? Do You Torture Your Teeth? New Yorkers pride themselves on being tough. Tough enough to deal with the ancient subway system. Tough enough to deal with masses of humanity on the sidewalks. Additionally, tough enough to live in the city. Our teeth are even tougher. But that toughness leads to problems — we take them for granted. We do all sorts of bad things to our teeth believing that they’ll forever keep chomping away on our behalf. But some of the things we do can do real, permanent harm to your teeth. Here are some things that torture your teeth, compiled by the American Dental Association. These are habits that Dr. Roberts, Dr. Sirota, and the whole team at Prosthodontics of New York would like to see our patients stop doing. Chewing ice — Men love to chew ice. And while it may be no-cal, that doesn’t mean it’s good for you. Chewing it can chip or crack your teeth. It also irritates the soft tissue inside the tooth, causing toothaches. Grinding your teeth — Life has its share of stresses, like watching the Mets play! For many people, those stresses are internalized and come out when we’re asleep and we grind our teeth. This is called bruxism. Everyone knows grinding your teeth is bad: it literally grinds your teeth down. Most people who grind don’t realize they do it, unless they awake with very sore jaws. But we can see the signs and get you into a mouthguard to wear at night. Fruit juice — If the “fruit juices” we drink were actually just fruit juice they would be much better for our teeth. Fruit juice “cocktails,” for instance, usually are made with only 10% of the drink being actual fruit juice. Look for fruit juices that are 100% juice. Otherwise, there is often as much sugar in the fruit juice “cocktail” as in soda! Even with 100% juices, show some resolve — they are often very acidic, which can weaken your tooth enamel. Bottle in the crib — Leaving a bottle in the crib with your baby isn’t feeding, it’s lazy and it can damage the baby’s developing teeth. He or she may fall asleep with the bottle in their mouth, bathing the teeth in sugars overnight. 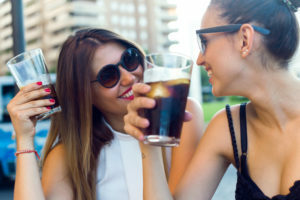 Sodas — Sure sodas have lots of unnecessary calories, but in the dental sense, the sugar isn’t necessarily the problem. Yes, the sugars can lead to dental decay, but sodas also contain phosphoric and citric acids. These are corrosives that eat away at the enamel protecting your teeth. Your teeth, the opener — While it can be amusing when someone is doing it in a movie, don’t you be that guy who opens bottles with your teeth. You can chip or crack your teeth very easily. Constant snacking — When you eat a regular meal, your mouth produces more saliva and that helps eliminate and break down residual particles. But when you snack for brief periods, you don’t produce saliva in the same way. The lack of saliva when you eat a snack means that food bits can stay in your teeth for hours. If you need a snack, opt for something low in sugar and starch, like carrots. Cigarette smoking — Cigarettes stain your teeth and lead to gum disease. As if that weren’t enough, tobacco also leads to cancer of the mouth, lips, and tongue. If you have been doing some of the above stuff, you could need an appointment with us. Call us at Prosthodontics of New York, (212) 758-9690, to schedule your appointment.